5 Tips For Winning a House Bidding War. Smart tips from a US News and World Report article for those buyers who find themselves in a bidding war on the home they are trying to purchase. Here’s a look at strategies for homebuyers competing in a bidding war. 1. Line up financing in advance. Nowadays, you may be competing with all-cash buyers, so if you need to get a mortgage, having financing ready to go can help reassure sellers. “Preparation is key,” says Gary Malin, president of Citi Habitats, a Manhattan real estate firm. “How much of a mortgage are you prequalified for? Do you have your commitment letter set up? Demanding a mortgage contingency will likely knock you right out of the box.” Some lenders now offer a process called pre-underwriting, where the lender puts borrowers through a more rigorous screening process than prequalification before they submit an offer. Redfin data show that in 19 markets, more than a third of properties sold for over the asking price in March. If you’re engaged in a bidding war, keep in mind that your lender may not want to finance significantly more than the appraised value of the property. If you offer more than the home’s appraised value, you may need to make up the difference in cash. “If you’re putting down 50 percent purchase price, it’s very unlikely that an appraisal is going to derail your deal,” Malin says. 2. Make a competitive first offer. If you’re serious about a property, don’t risk insulting the seller with a lowball offer. “For my buyers, I always tell them to put their best foot forward and present their best offer from the beginning, allowing a little wiggle room for negotiation,” says Lisa Harris, a Re/Max Realtor serving the northeast Atlanta area. Malin reminds buyers that in addition to submitting a thoughtful offer, making sure your paperwork is complete and organized can help make a good impression on sellers and their agents. “It’s not only the money,” he says. “It’s every little thing that you do along the way.” Also be flexible on the closing date if you can to fit the seller’s needs. Redfin estimates that waiving financing and inspection contingencies each improve an offer’s likelihood of success by 15 percent. 4. Be available to your agent. 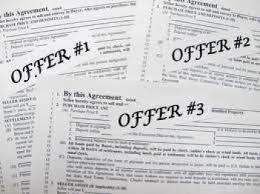 Once you make an offer and the seller responds, you may have a limited window for accepting or countering their offer. Harris says the common practice in the Atlanta market is if sellers have multiple offers, “they’ll give everybody the chance to come back and give [their] highest and best offer.” If that happens, time is of the essence, so your agent may need to reach you quickly. If you turn off your phone or ignore emails during a bidding situation, you may miss out on the property. 5. Write a love letter about the property. One strategy buyers use to tug at sellers’ heartstrings is the “love letter,” a cover letter explaining why you personally love the house or the neighborhood. This can be especially effective when you’re planning to use the property as the family home, but you’re competing against investors who plan to rent it out. “Oftentimes sellers appreciate the personal touch,” Simon says. “I recently had a seller who had raised three children in this house and was in tears hoping the next family would be a family whose kids could play in the cul-de-sac.” Include a photo, ideally of you and your family standing in front of the property, if you can. This won’t always trump a higher offer (or one in cash), but for the right seller, it may tip the scales in your favor. Don’t Sell Your Home, Rent It!